Where our dreams take us towards to the island, up the slender, to the flexible coconut trees. On the sandy beaches of the Pacific where the plants grow with their need for sun and warmth. Coconut can be found worldwide in the tropics. Also curious how sympathetic is also their distribution form: Since coconuts swim well and moreover extremely they are long durable, it was possible for them away to colonize on the ocean also on very distant coasts and islands, even before the man could cultivate there. These delicious coconuts, full with fruity meat that makes our SLICED COCO to a gorgeous tropical snack, which tells us of distant lands, the sun, beaches, and seas. 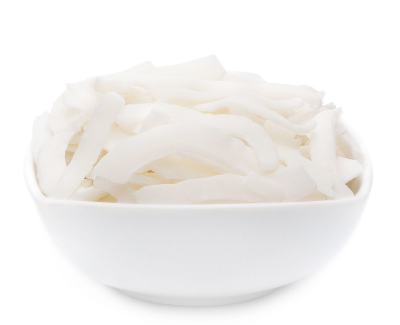 The carefully dried coconut meat, not only keeps the full fruity flavour but all valuable ingredients such as folic acid, zinc, and selenium of ripe coconut - this taste distinguishes the SLICED COCO. Full coconut taste in fine shavings, natural and absolutely pure. Ideal for supporters of Clean Eating, who appreciate the genuine taste. Furthermore, offer delicious SLICED COCO countless uses in order to indulge in this inviting Caribbean feeling. The fresh coconut meat is a perishable product. With the carefully dried SLICED COCO you can at any time to enjoy on the safe side, an aromatic and natural product. The uses for the fine coconut shavings are many. The classic is certainly the cereal, which you can spice up so wonderfully. As Decoration on a tropical fruit salad, the filigree SLICED COCO makes outstanding and are a pretty nice eyecatchers,or they can be served as a healthy alternative to chips. A tropical palates that will certainly take your minds!